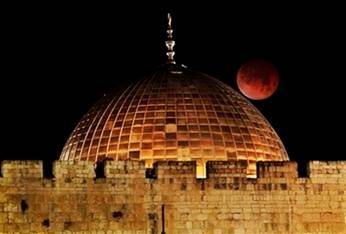 This famous photo of the Blood Moon over the Dome of the Rock taken February 20, 2008 was what spurred Pastor Mark Biltz of El Shaddai Ministries to find the incredible Four Blood Moon teaching. I have been following Pastor Mark Biltz via Bill Koenig of Watch.org and both are credible in their reporting. This morning I discovered an 3 incredible facts of this beautiful photo. The Blood Moon was on a Shemitah Year. The 7th year of the 7 year cycle for the land as ordered by God in Leviticus 25. February 20, 2008 was the 14th of Adar 1, called “Little Purim”. When the Hebraic calendar has a leap year there are 2 months of Adar, 1 & 2 or A & B. The festival of Purim always falls on the 2nd month of Adar during a leap year, but the first month is also joyous. It is called Purim Katan and the thought is “Always Happy”. A Hebrew leap year is called a “pregnant year” since it has 13 months instead of 12. I think this year was pregnant with the unveiling of the message of the Four Blood Moons!! !